2 cm / 3/4" is this lovely old Golden pocket knife. It is working. 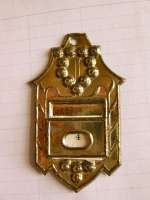 Nice for the desk in the Old doll house or as an accessory for a doll. Exzellent condition. Antique miniature dollhouse shaving mirror with brush. Shaving mirror with brush for the doll house gentleman! What a great accessory for the bedroom or bath in a dolls' house. 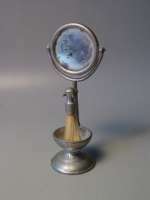 Its round mirror swivels and a great shaving brush hangs from a hook. Measurements: 2 3/8"h./ 6 cm. Circa: 1900 Excellent condition. 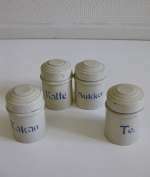 Here are four tin containers for storing food in the doll kitchen or in a shop. Lid to open. All white painted with blue print of the food. H. 4,5 cm/ 1 3/4" Ca 1900. Excellent original condition. The price shown is for one. Racing car made by Jean Höfler,Germany. 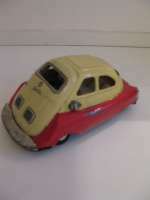 Large racing car made by Jean Höfler,Fürth,Germany about 1955..Excellent condition.Working fine by flying wheel. L=15 3/4 inch-40 cm. Jetta. Isetta like vehicle made in Japan in 1950es. Jetta. Isetta like 4 wheel vehicle made in Japan in 1950es. Marked "Made in Japan".Producer unknown. Flying wheel .Good condition. One of the sides have a scratch. L=5 1/4 inch-13 cm. Offener Sportwagen, hergestellt von Josef Neuhierl, Deutschland. Ford Taunus Pick Up.Tin plate car made in Japan. Ford Taunus Pick Up.Tin plate car made in Japan in the 50es. Marked with:" K T S Japan". Good condition and working perfect by flying wheels.L=8 1/4 inch-21 cm. Fine French Art Nouveau Calender in golden tin with impressed design. I have not had this calender before, It is a nice art nouveau style, with a paper to change for each day of the month. The impressed design is nice. It has a hole fot hanging at the wall. Size: H. 2 1/4" Excellent condition. Ca 1890.